This nursing vixen found in Hertfordshire has taken a wounding rifle shot in her central mammary glands. 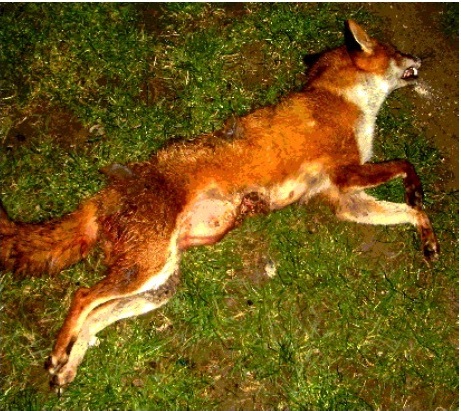 Independent research has shown unacceptable levels of wounding with both rifles and shotguns, and clear evidence that the largest percentage of fox shooting, outside specialist gun packs, is conducted without an effective means of following up a wounded animal. Cambridge University research shows that, outside specialist gun packs, most foxes are shot in the months of February and March, when vixens are pregnant and nursing. Regardless of whether the vixen or dog fox is shot, the primary casualties of this indiscriminate slaughter will be the fox cubs (up to ten in a healthy vixen as above) on the loss of milk or food supplies. This major welfare problem was recognised by the Scottish Society for the Prevention of Cruelty to Animals, who ensured that Scotland’s Hunting Legislation allowed the use of licensed terrier work at the earth or refuge, to make some inroads of resolving the starving fox cub issue. Soft terriers will retrieve fox cubs for humane dispatch. The RSPCA refused to recognise and discuss the wounding issues, the following up issues, and the starving cub issue, thereby demonstrating that, contrary to its stated objectives, they are promoting cruelty and preventing kindness. They have neglecting to inform the public on these welfare issues, and ignored the comparative measurements of suffering between hunting and shooting methods, which provides proof of the much greater humaneness of hunting methods.